More than two years have passed since the W Food Pantry opened its doors on April 2, 2017.In that time, it’s served more than 1,300 students and distributed more than 20,000 pounds of food. What was once a vacant retail space in the heart of campus was transformed into the W Food Pantry, which has provided students in need with free access to nutritious food and basic necessities, all while uniting the campus community and breaking down stigmas. volunteers, who have completed 3,339 hours of work. Nationally, food insecurity among college students — defined as having a lack of secure, consistent access to nutritious and affordable food — is estimated to be approximately 36 percent. While research is still ongoing, Wayne State University estimates that as many as 10,000 of its students are food insecure. The W, located at 703 W. Kirby, is run by Williams-Fox, along with a dedicated team of 15 student leaders who provide support and serve as shift leaders alongside a growing list of volunteers. Since launching, the pantry has expanded its offerings from perishable and nonperishable goods, toiletries and women’s hygiene products to also include assorted household necessities and school supplies. Any student who is currently enrolled or making progress toward a degree is eligible to visit The W twice a month for up to two bags of food and supplies; a third access is granted upon emergency need. The pantry is a collaborative effort led by the Office of the Provost and the Dean of Students Office, with support from Housing and Residential Life. The W was made possible by the McGregor Fund through a 2016 universitywide grant designed to address the needs of homeless or otherwise vulnerable students. To date, 75 percent of the food distributed by The W has been donated by the campus and surrounding businesses and communities. As a designated Gleaners Community Food Bank pantry, The W is able to purchase food and other supplies at a discounted rate of 10 cents on the retail dollar, along with access to food specials from the U.S. Department of Agriculture. The W also partners with Forgotten Harvest. Williams-Fox said traffic at the pantry is consistent throughout the year and, with the help of community partners and volunteers, The W has expanded its impact beyond students’ cupboards. As part of a partnership with the Michigan Department of Health and Human Services, caseworkers are available to meet with students in the Welcome Center to provide information and assistance about state and federal benefits, including the Supplemental Food Assistance Program, emergency relief, childcare assistance and more. In collaboration with the Office of Economic Development and the WayneRides program, The W has also provided free regional transportation passes as available. The pantry has also worked with the Department of Nutrition and Food Science to provide recipes and suggested grocery lists. Volunteers are equipped to answer questions about meal planning and food safety. Beyond providing assistance to students, The W has also created a strong sense of camaraderie and compassion among its growing volunteer network. In its two years, The W has welcomed nearly 500 volunteers, who have completed a total of 3,339 hours of work. Volunteers play an integral role in coordinating The W’s annual Hunger and Homelessness Awareness Week activities, as well as food drives at campus events. The pantry also has an active and growing social media presence. 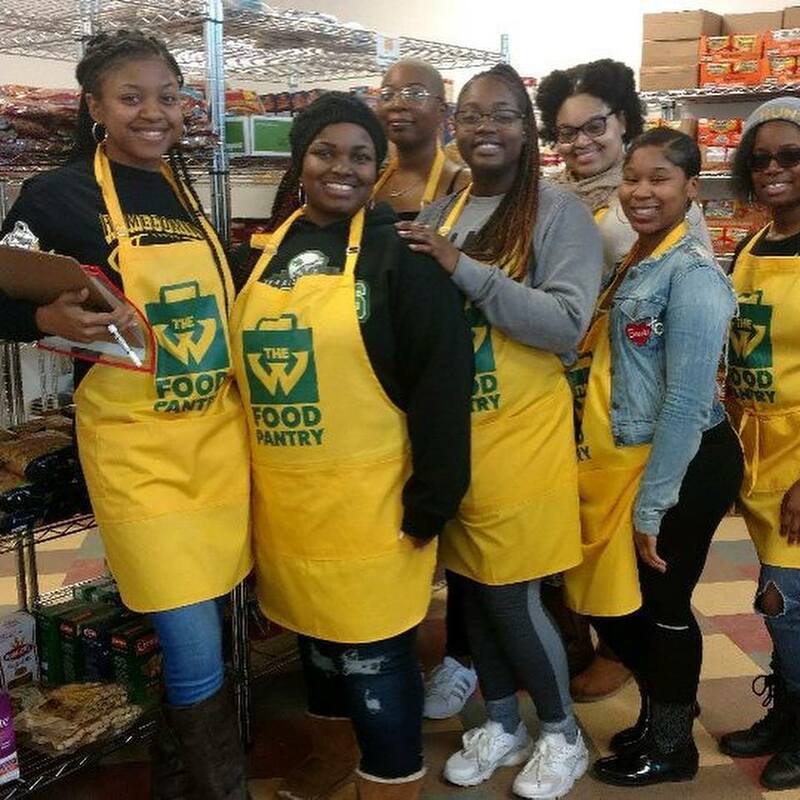 In opening The W, Wayne State became one of nearly 500 colleges and universities across the nation to offer a food pantry addressing the growing risk of food insecurity among college students. 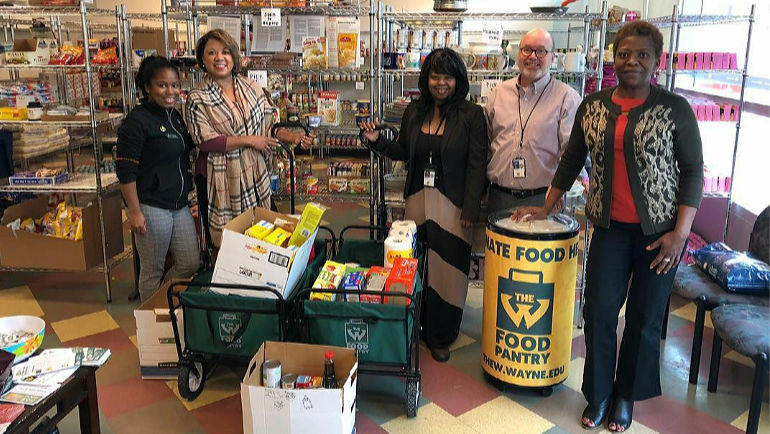 The W’s rapid growth has gained national and local attention, and representatives have shared their experiences at the annual Michigan College Campus Food Pantry Summit. Take a tour of The W! To learn more about The W — including how to make a donation or volunteer — visit thew.wayne.edu or contact Rainesha Williams-Fox rai@wayne.edu or 313-577-2743.